Try these enchanting spring perennials for a shady spot. If you’re looking for an elegant and effective way to clothe shady ground with decorative foliage then look no further than epimediums. These plants really come into their own at this time of year as wiry stems support new mottled foliage that unfurls in various shades of red, bronze and lime green. As leaves emerge enchanting sprays of four-horned flowers on strand-like stems appear, in almost every shade, except blue, quivering in the breeze like shoals of tiny tropical sea creatures. Related to berberis, a close inspection of the flowers reveals a more complex structure, the various parts sometimes in different tones giving a bicoloured effect. 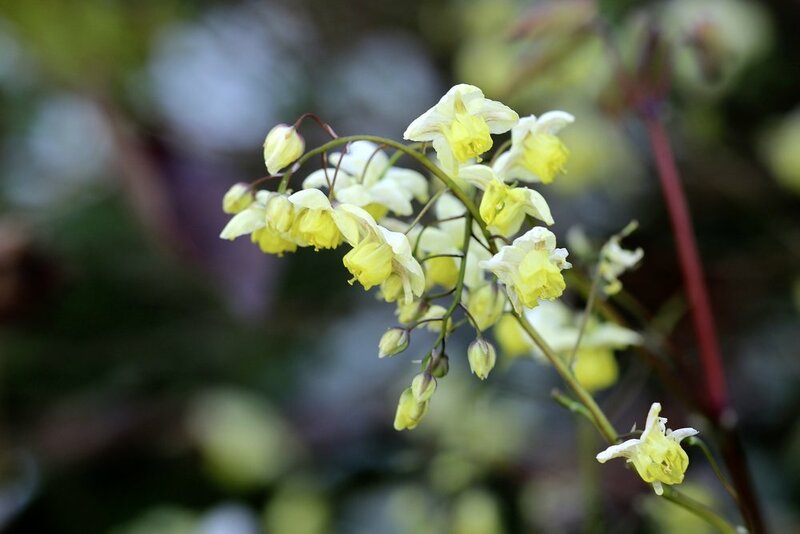 Known as barrenwort or bishops mitre, most epimediums come from China and Asia, while a few, such as E. perralderianum come from Mediterranean regions, and are more able to withstand drier conditions. While some species are deciduous, others are semi-evergreen or evergreen perennials slowly expanding by fine underground rhizomes to form dense weed-proof clumps. While young foliage is often vibrantly patterned in shades of red or bronze as it matures it usually turns green, but in some species the tonal hints or red margin remain. By winters end if plants are looking a little unkempt, simply shear off the foliage just before the new foliage and flowers emerge. Being woodland plants epimediums enjoy moist, but well-drained soil, but some, such as E. rubrum and E. versicolor will endure drier conditions once fully established. They appreciate a mulch to help keep roots cool and the foliage in good condition. Clumps can be moved or lifted and divided in autumn.